BENNYS ULTIMATE ‘BIG PICTURE’ PICTURE BOOK LIST. More and more nowadays we are seeing children’s books, and their authors, becoming increasingly self aware and using the platform to share larger ideas. 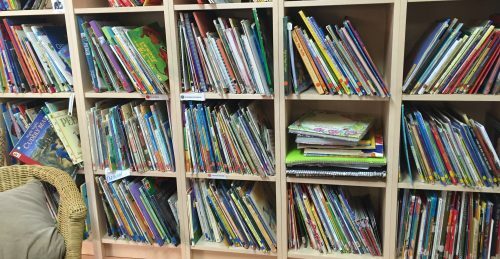 Books aimed at the young are becoming somewhat of a political playing field, with societal hot topics being presented and discussed in a way the young can comprehend and understand. Some dip their toes in the pool of the condesending, labouring their message to the point of patronising, while others pitch way above their desired audience, presenting confusing abstract ideas only relevant to the parent, whose then left to unscramble the brain of the confused child. However, there are authors out there who are, whether by shear chance, genetics or tireless observation, completely and precisely in sync with the sensibilities of a child and have provided works far beyond their initial reading. So I thought I’d share some of my favourites. Like with all my lists, I cannot claim these to be the best. There are just simply too many books in this world for me to truly have a clue, however, these are the ones that have found their way into my lap at one time or another, that kind of blew me away. 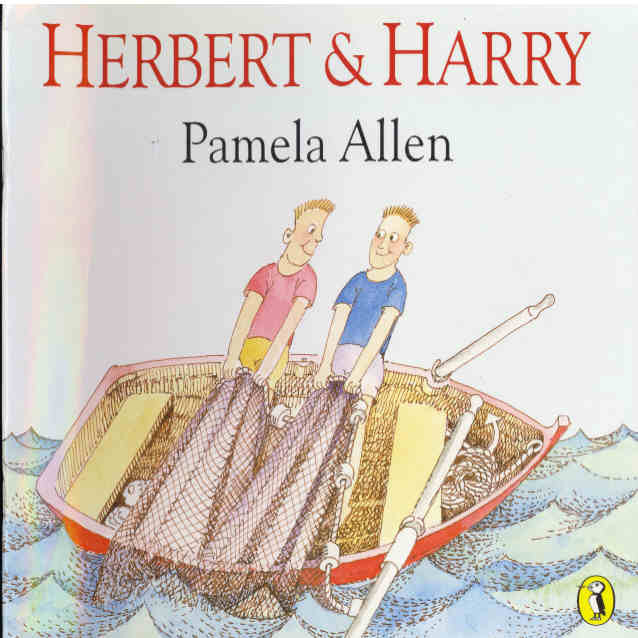 Herbert and Harry are brothers who do everything together. One day while fishing, the two brothers find treasure caught up in their net. A small argument sees Herbert declaring the treasure to be his and so begins his life long commitment to protecting his treasure from…well, anyone who may want to take it from him. As his attempts to protect his wealth grow in paranoia and absurdity, his brother, Harry grows old surrounded by children and grandchildren, completley unaware of his brothers madness. Pamela Allen is no tourist to the land of bigger picture children’s books. Black Dog is about as good an example as that gets, but amongst all her multilayered triumphs lies a hidden gem about priorities. What makes this book so lovely is it never tells you who’s right and whose wrong, rather, whats important to you? Although its pretty clear on which side of the fence Miss Allen sits, she simply presents a stark reality, allowing the idea to sit within the child’s head to perhaps surface later at a time you least expect. Pretty much every book of Jeannie Baker is steeped deeply in the tradition of layered observation. From ‘Where the Forrest Meets the Sea’ to ‘Mirror’, her points are beautifully subtle while somehow clear and direct and there is certainly no misgivings with this reader of her ability to gently take a child by the hand and lead them down the less explored path. However, for me, Belonging is her finest journey. 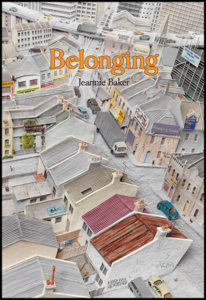 Belonging is a book that explores the changing of a local neighbourhood seen through the eyes of a young resident, Tracy. What makes this truly beautiful is it tells the story of a community transforming its neighbourhood. Reviving its often cramped surroundings into a community with pride. An interesting side not: this book is rumoured to be the partner story to her book, Window. A story of a child watching their neighbourhood grow from its leafy country surroundings into a bustling neighbourhood. We watch the child grow into an adult and then ultimately decide to move farther out from the burgeoning township, into the serenity and calm of the bush. ‘Once there was a man. The man had a son.The son loved the man. 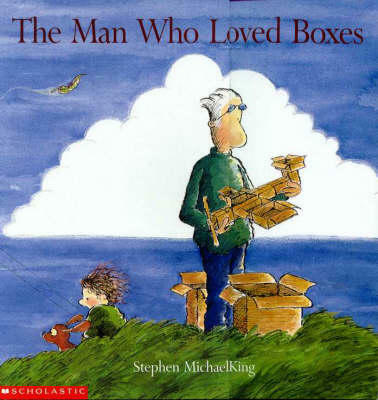 And the man loved boxes’ And so begins our story about a father and son and their love for one and other. Stephen Michael King is an author with great gentleness. His stories are often very subtle with little to no message pounding but rather relying on relationships between people to set his scene and detail his plans. Henry and Amy being a beautiful example of this. But where as Henry and Amy deals with the celebration of differences between people, The man who loved boxes explores the complex relationship between a parent and child. In very short, the story is about a father who, unable to find the words to express his love for his son, he finds he can do it through boxes. Relationships between parent and child are tricky ones to discuss in books as you are trying to promote an emotion in a child they may be truly uncomfortable to voice. A child will openly discuss their misgivings or uncertanty with a friend but no so quickly about a parent. This book skilfully allows a child to perhaps dissect their relationship with a parent and view it from a different angle while never compromising on the love and security shared. And its about boxes. Kids love boxes. So, you know that book ‘The Gruffalo’? That one written by Julia Donaldson that is about the biggest children’s book to plummet to earth from outta space in the last 20 years and totally consumed our children’s lives and bed spreads and soft toys and drink bottles and DVD shelves and BAFTA awards? Well the gentleman who breathed illustrated life into that story (and nearly all Julia Donaldson’s stories) is Axel Scheffler. You may have already known that. I mean, you probably definitely knew that. 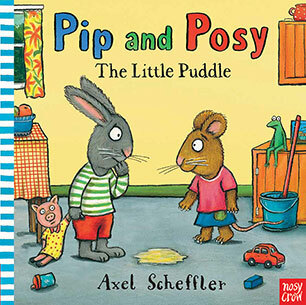 however are you familiar with his own series of books, Pip and Posy? Mr Scheffler has given us quite a few Pip and Posy books, aimed at the toddler market, and by and large, they are all good yarns. However, for me, one of them rocketed straight up to the cold hard steel door of brilliance and kicked it in, making itself well and truly at home. The little Puddle. This book is about one of the main characters, Pip, having an ‘accident’. No guesses as to the nature of this accident. But what’s brilliant is this ‘accident’, which I shall from this point on refer to as wee-gate, happens half way through the book, and then once cleaned up, the action keeps going on and the friends have a great time. BRILLIANT!!! This whole book is about taking away the importance and significance of wetting oneself. It simply and wonderfully, says “Oh well. No biggy.” If you scan the shelves of the well-meaning toileting books out there, you’ll find they often concentrate on the ‘trying’ and how it ‘takes time and practice’, and ‘don’t be afraid of the potty’. But not ol’ Mr Scheffler. He says. So what, you’ll get there and in the mean time lets get on with playing. Totally demystifying, unchallenging and removing the fear and loathing of the ‘practice’ in one hard cover book. This may not seem like a ‘Bigger Picture’ deal to us, but to a 2-3 yr old. Its like a fresh pair of underpants. Its a little hard for me to write a list about books without somehow mentioning Bob Graham. He’s just that damn good. 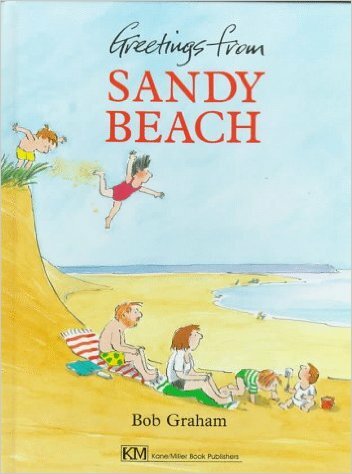 Greetings from Sandy Beach is a story about a family’s camping trip to the sea side. Theres no adventure, no hidden treasure, no ‘and thats what we learnt’ scenario. Just a family on a camping trip and stuff happens. In the opening page, dad cries because he misses the dog. and its never mentioned again. They end up camping next to and becoming friends with the ‘disciples of death’, motor cycle gang and nothing is said of it. Bigger Picture? Its just real life. Real people. doing real things. looking real, and in the hands of Bob, its no big deal. 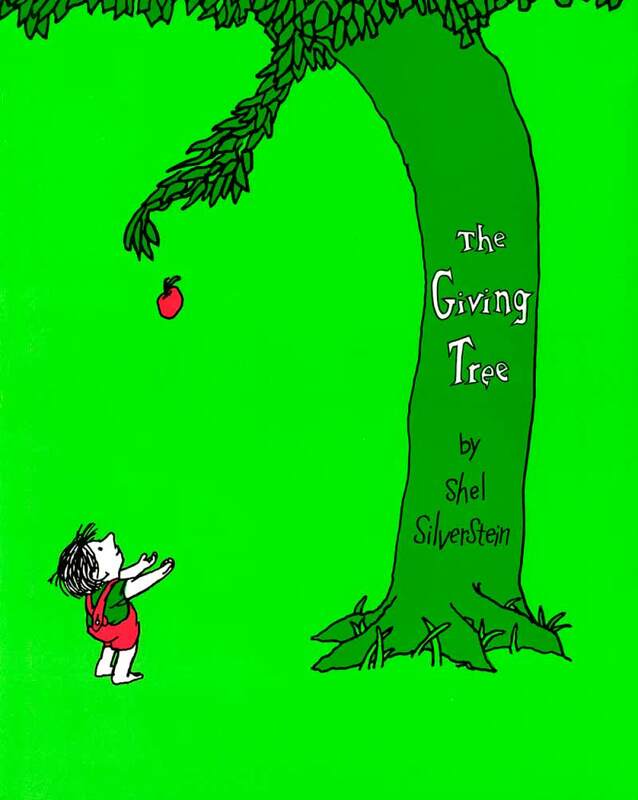 The giving tree has been around 50 odd years and seems to have a renaissance every decade or so. If you aren’t familiar with it, you will be soon enough, for someone will stumble upon it and it will be shared like wild fire through your child’s mates parents. Yes, the parents. This isn’t really a book that survives out of child interest but rather out of the interest of adults. the reason being, is it is pretty dark and in its lifetime has garnered a bit of controversy but an enormous amount of praise and celebration. In a somewhat simplistic explanation of the book, it is about a boy and its relationship with a tree. Each stage of the child’s life, from birth to death, sees the child visiting the tree and requesting something of the tree which the tree happily obliges. Apples to sell, wood for a house, a stump to sit on. needless to say, it is all pretty much one sided and the tree spends its life tirelessly and quite selflessly providing for the boy, who…never really says thanks. The book has provided a whole array of theories as to its meaning. Some say its about the unrequited love of parent and child, others say its about nature and mans abuse of its offerings, others swear there are religious teachings in there. However, what this does tell us is how open and varied its lessons. It would appear it has the ability to make all of us ask, what the hell is my life about. Or more importantly, what the hell is this book about. Some argue its not really for kids and has accidently found itself in the picture book genre, but either way, it is a good book to inspire deep thought in your kids. 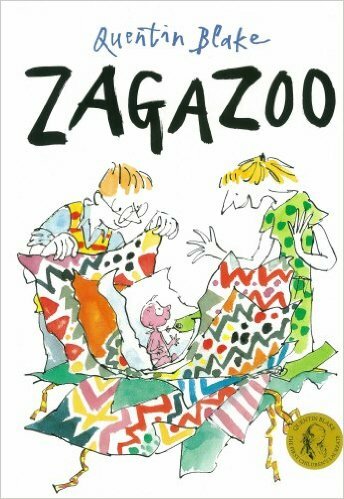 Zagazoo is the story of couple Bella and George, who one day have a baby delivered to their front door. As the baby grows it turns into multiple different animals ranging from a fire breathing dragon, bumbling elephant, to screeching vulture. Each animal skilfully and amusingly representing the phases of growing up, from childhood through to adulthood. At which point he, Zagazoo, turns into a polite young man and his parents, Bella and George, turn into Pelicans. This book doesn’t pose big world problems, nor does it ask us to save the world or be more observant to its shortfalls but rather presents a view point of growing up, in surprisingly accurate, and comical metaphors, allowing the children to ultimately have a laugh at themselves. Simple, gentle, pleasant and a surprising thinker. This is the story of Gus the Asparagus. His family aren’t Asparagus’ and neither are the kids at school. Gus finds things a bit difficult to understand and do, and often misinterprets things. His fascination in different things makes him unique and wonderful. 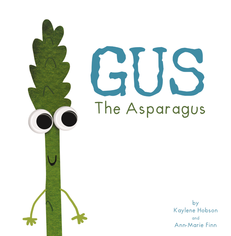 Through the course of the book Gus is diagnosed with ‘Asparagus Syndrome’ and subsequently he and the people around him are given ideas and a set of skills to use to allow Gus to be everything he can be. This book is great and no guesses as to what its alluding to. Both the authors have children with Autistic spectrum disorders and wrote the book to help other children understand their own children. (click the link and hear their story) Although contrary to my own prerequisites for what constitutes a big picture picture book, this book does give answers and does have a clear well explained agenda but the agenda is great and its dealt with in a way that only a parent closely linked to Aspergers can do. Oliver Jeffers is as about as hipster as chinos, beards and a chai tea served in a tin can. He is so hot right now. But unlike the beard, chino and a tin can cup, we are probably less likely to look back on his work and feel uncomfortable trying to explain to our kids why we thought it was cool. Fact is, Mr Jeffers writes better than most and his stories are beautifully simple and poignant. The New Jumper is of no exception. In a nut shell, it’s the story of Rupert, the Huey, who decides one day to wear a new jumper. This is a bit of a scandal as Huey’s are all the same. Sure enough, the Huey society isn’t ready for Rupert’s blatant disregard for their ‘sameness’ and accusations begin to flow behind the unsuspecting Ruperts back. That is until his friend decides he kinda fancies Ruperts jumper and knits his own and before long, all the Hueys look different in their new Rupert, inspired pullovers. 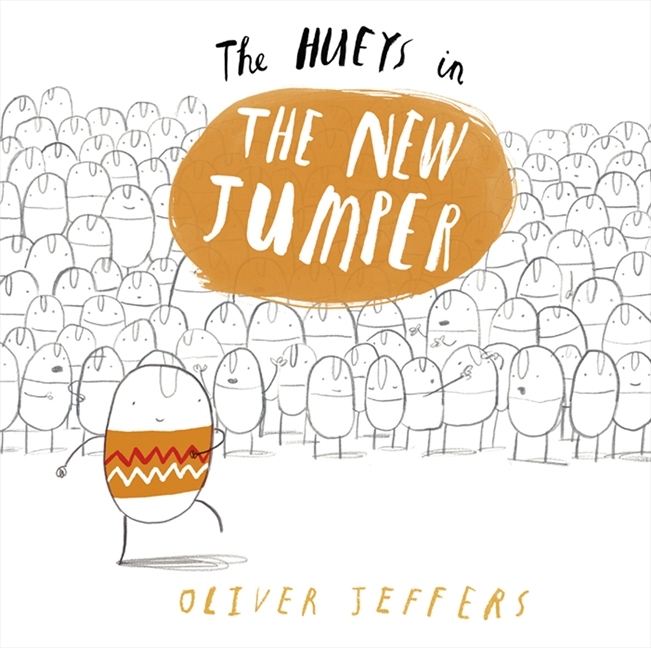 This book is rich with lessons, from the desperate attempt from all the Hueys to look the same, to the colourless artwork, however, there is an aspect to this book which I feel makes it utterly unique. Most books pushing the individuality agenda tend to deal with the fall out of individuality on our main character. This, on the other hand, has nothing to do with Rupert. Its about everybody else. Rupert simply gets on with life feeling chuffed at his jumper, while those around him judge him, fear him and ultimately begin to admire him. Its a book about the influence of individuality and expression on others, and how ultimately its a wonderful thing. And it is, and Mr Jeffers has reminded kids that its worth your while to stand out, the world will catch up to you eventually. So thats it, my Bigger Picture Picture book list. Im not sure if only 9 books really covers it, however, these are 9 books that I have always admired their skill. Feel free to let me know of any you feel deserve to be on this list. Books are there to be shared. The Plot Thickens with Luke Escombe.